A quote from a favorite movie at our house comes to mind, “Pile it high and deep Mrs. M” (What About Bob). In the scene Bob Wiley was talking about salad, here I am talking Nutter Butter Chocolate Cake! 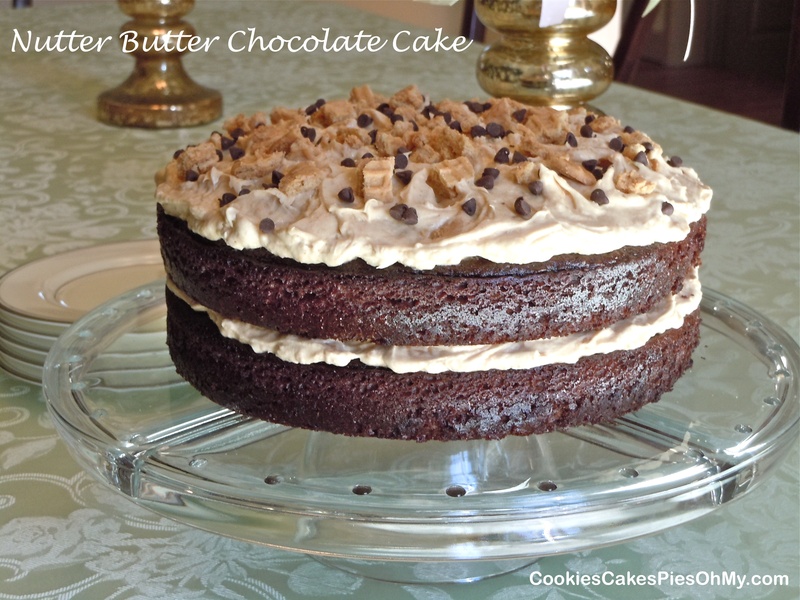 If you are a chocolate & peanut butter fan, please make this cake! Moist chocolate cake and creamy peanut butter frosting with Nutter Butter Cookies! Preheat oven to 350°. In large bowl, stir together flour, cocoa, sugar, baking powder, baking soda, and salt. In another bowl, stir together buttermilk, oil, eggs, and vanilla. Add buttermilk mixture to flour mixture and beat with electric mixer for at least 2 minutes. Add boiling water and mix until well incorporated. Batter will be thin. Pour into two 8″ or 9″ round cake pans liberally coated with non-stick spray (3 cups batter in each). Bake for 28-30 minutes or until pick inserted in center comes out clean. Cool completely before frosting. Combine melted butter and peanut butter. Mix in powdered sugar until fluffy. Fold in Cool Whip until totally mixed into peanut butter mixture. Fold in chopped Nutter Butter cookies. Spread half the frosting over the first layer of cake, set second layer of cake over frosting and remaining frosting over the top of cake. Sprinkle more chopped Nutter Butter cookies and mini chocolate chips if desired. Keep cake in refrigerator.